Plymouth, NC Bojangles'® Tands, INC. Store #31 - Bojangles'® / Tands, Inc. Heading to Nags Head? The Plymouth Bojangles’® on 601 US and Highway 64 is the perfect place to stop and eat when you’re traveling! Plymouth locals love the bold flavors and filling, affordable meal options at Bojangles’®. It’s easy to feed the whole group on the go with a Bojangles’® family meal. 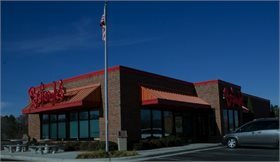 Plymouth Bojangles’® is also proud to serve the Washington County Hospital patients, staff and their families. If you love fried chicken, fresh biscuits and southern-style sides like Bojangles’® Dirty Rice® and cole slaw, it’s Bo Time! For breakfast, lunch or dinner in Plymouth, NC, Bojangles’® has the food you crave at great prices. You’ll always receive fast, friendly service.